Heat oil in wide saucepan over medium heat. Cook the onions until half soft. Season the onions with salt, pepper, and thyme. Continue cooking without browning until the onions are very soft. Set aside to cool. Divide onions between individual serving dishes. 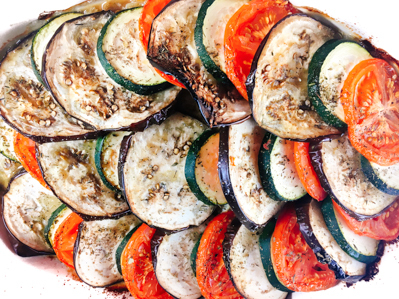 Arrange alternating slices of tomato, zuncchini, and eggplant, standing on end. Drizzle with oil. Sprinkle with salt, pepper, ground thyme, and ground bay leaf. Bake until cooked and well browned, about an hour or so. After the vegetable start to soften, press them flat with the back of a slotted spoon.